Big Red Barn Launches Modular Homes at the National Ploughing Championships 2017. Big Red Barn has started to manufacture Modular home’s of any size or shape for the open market. We custom design and build your home to your taste and look. Interior design layout of the home is your choice. – Wide Range of Colours to choose from. Pressure treated Killen dried Scandinavian pine – Shiplap or Log effect. 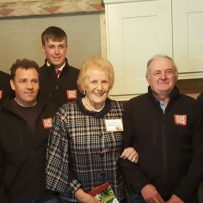 The Modular home was opened by the Queen of the Ploughing Anna May McHugh. Check out the link below to see the official opening of our Modular Home and walkthrough video.